Before you say anything--those are apples not potatoes on the top of the soup! Mulligatawny sounds Irish but it's an Indian soup. This was a VERY simple dish to pull together. We had it with a salad to make a meal out of it, but this is fast enough to pull together for a light lunch. This soup is not as hearty as the ones you get in the delis or restaurants. Maybe because it doesn't have any rice or other veggies. You could add some cauliflower or carrots to beef it up--I think I will the next time I make it. The apples are what make the whole thing come together, though, so don't skimp on those. I used Granny Smith (organic from California) with great results. I got this recipe via PureWow and they adapted it from a cookbook called Poulet. 1. In a large saucepan or Dutch oven, heat the oil. Add the onion and cook over medium heat, stirring frequently, until it is soft but not brown, about 5 minutes. Add the garlic and curry powder and cook until fragrant, about 1 minute longer. 2. Add the stock and chicken to the saucepan, cover and simmer over low heat for 10 minutes. Meanwhile, in a medium bowl, toss the apple with the lemon juice. 3. Whisk the coconut milk and lime juice into the soup. Remove the soup from the heat and season with salt and pepper. 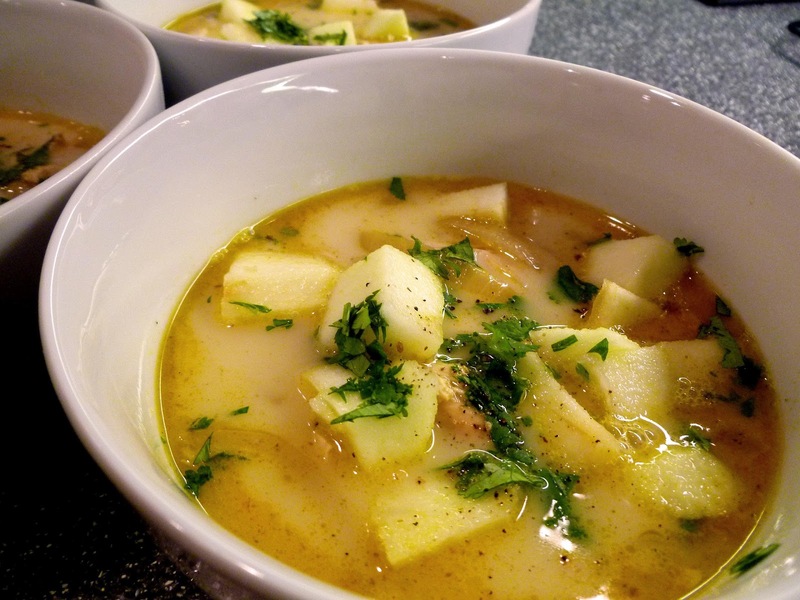 Divide the soup among four bowls and garnish with the apple mixture and cilantro. Serve immediately. These ribs were on sale last week at the Prather Ranch stand and I've always been curious about them. Now, as you are most likely aware, "BBQ" usually signifies that the sauce will have tons of sugar. In fact, when I tried to find a marinade for this a lot of the posts had referenced this one restaurant in Maui called Azeka's (which is no longer in existence) and all the recipes called for at least a cup of sugar. It makes sense, they grow the stuff all over the place there. Never having actually been to Hawaii (!) (Ahem! Ahem! STEVE!) I was a little stumped. Then I typed in "maui ribs paleo" into my little search engine that could and up popped this great recipe from Mark's Daily Apple. Check out his recipe, he has a lot of great pictures and an explanation of the cut of the meat. He got it by holding a contest and this guy, Christian Chun, really came up with a great marinade. Mark also offers an alternative using blackberries but since they are not in season right now, we'll have to wait a bit to try it that way. What ARE available now are kiwis from California and although while there are Asian pears out there in the farmer's market, I used a pippin apple and a pink lady with fantastic results. I found the pippin at Good Earth Natural Foods and the pink lady is all over the place still. If you can't find a pippin, try the honey crisp. That's roasted butternut squash with sage in the background. 425 oven, cut squash in half, remove skin and seeds. Cut squash into chunks, drizzle with olive oil, sprinkle with sea salt and fresh sage. Roast for 20 min. turning at the halfway mark. 2 pounds beef short ribs. For Korean short ribs, “flanken-style” is the preferred cut. Flanken-style ribs are about 1/2-inch thick and contain three rib bones. This marinade can also be used with other types of beef, such as 1/2-inch thick sirloin steaks. Chop the fruit up into chunks and put all marinade ingredients into a blender until smooth. Grill ribs four minutes on each side for rare and a minute or two longer for medium rare. 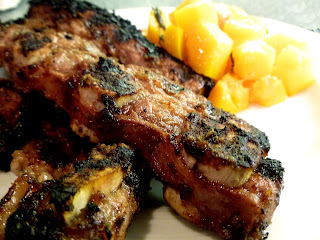 The ribs can also be cooked under a broiler, but might take 3-5 minutes longer to cook. 1. Fit a steamer basket in a wide-bottomed pot (such as a Dutch oven) and add enough water to just reach the bottom of the steamer. Bring the water to a boil and add about a quarter of the carrots in a snug layer. Cover the pot and steam the carrots until just tender, about 6 minutes. Transfer the carrots to a bowl and, working in batches, steam the remaining carrots. Set aside to cool slightly. 3. Drizzle the dressing over the carrots and add the parsley. 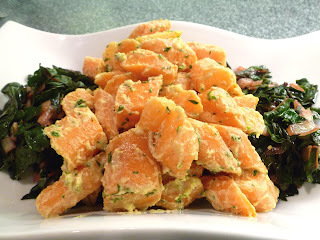 Toss until the carrots are thoroughly coated with the dressing and transfer to a serving plate or bowl. Serve immediately or at room temperature. Let's take things down a notch shall we? I've been posting a lot of heavy meat lately, I know. I don't want you to think we ignore our friends from the oceans and rivers it's just that I am really not the greatest at cooking fish, but every once in a while it works out (sort of, I was hoping for a better looking "brown" on the filet, but it tasted great and was cooked perfectly). I'm really hooked on the winter citrus out there right now, so I used blood oranges, pommelo, cara cara oranges and a navel orange on this dish. All organic, all local to the area. Even the avocado was from Oxnard. I used line-caught sea bass from Alaska that I picked up from Whole Foods as I ran out of time to get down to Fish and pick something out a little more local/sustainable. As it has been of late, this recipe is from Epicurious. Preheat oven to 450°F. Using a small sharp knife, cut off all peel and white pith from fruit. Working over a medium bowl, cut between membranes to release segments into bowl. Squeeze in juices from membranes; discard membranes. Drain fruit, reserving 1/2 cup juices. Return segments and juices to bowl. Season with salt and pepper. Pat fish dry. Season with salt and pepper. Heat a large heavy ovenproof skillet over high heat. Add grapeseed oil. Add fish; cook without moving, occasionally pressing fish gently with a spatula to keep all of surface in contact with pan, until fish is golden brown and releases easily from pan, 4–5 minutes. 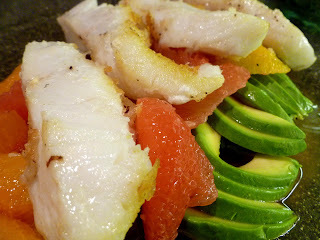 Turn fish, transfer to oven, and roast until just opaque in the center, 3–5 minutes. Place fruit and avocado on plates. Top with fillets. Spoon 2 tablespoons citrus juices over fruit on each plate. Drizzle 1 tablespoon avocado oil over fish and fruit. (Get In My) Pork Belly! Oh. My. Goodness. I have never attempted this type of dish, never really thought of it as a possibility. In my California mind it goes against almost every instinct of "healthy food" I could think of. And yet. I was at the Marin Sun Farms stand on last Sunday's market and there was this slab of pork belly. I ask the guy at the stand, "Is this what bacon's made from?" He replied, "Well, yes, but you'd need to cure it, then smoke it to get to where it's bacon." 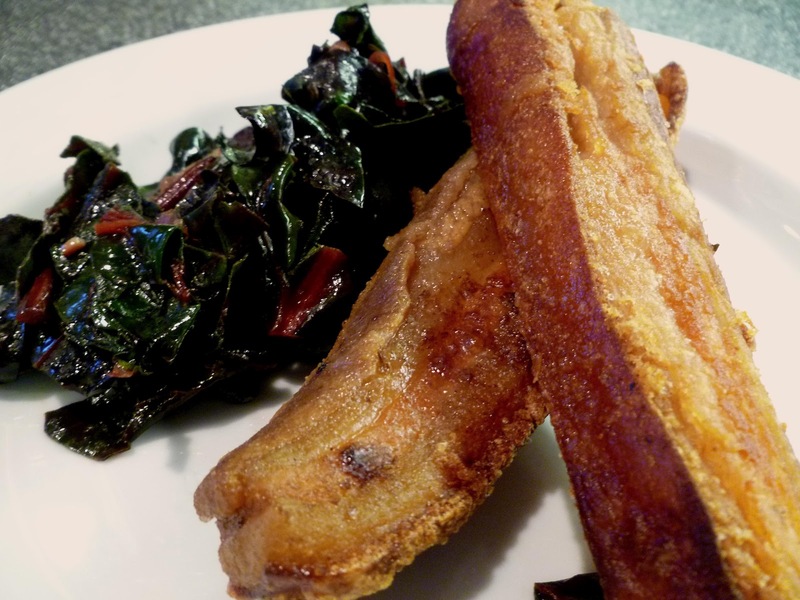 Well, I don't have a smoker (yet), but I knew I'd seen pork bellies on some cooking show recently--Chopped, Iron Chef...--and then there's always Epicurious where I found this recipe from my favorite chef ever, Dan Barber. Dan Barber runs my Mecca of all things food. Blue Hill at Stone Barns in New York is where I am really looking forward to experiencing some day soon. This pork belly is so simple and I promise you will never look at the belly of the pig the same. It does take a few days' curing time, but the cooking process is very straightforward and I did mine in the crock pot. A couple of notes about this recipe and the cure mix. I omitted the sugar from the cure entirely and it came out fabulous. I was a little worried the sugar would do something specific in the curing process as so much is called for it but the dish turned out amazing, so if you want to cut the sugar out, go for it. After the curing process I did rinse everything off per the recipe and then put it in the crock pot in the morning, added the chicken stock, then set it on low for 8 hours. When ready to start the searing, remove the pork belly gently, it will be very tender and you want to keep that fat layer intact. When you go to sear the slices--I cut mine about an inch thick--watch yourself with the hot pan. I used a little grapeseed oil to get the non-stick effect. DO NOT stand directly over the pan. The moisture from the pork belly will cause everything to pop and splatter, and you can get a nasty oil burn if you don't watch out and stay back. Wear long sleeves. This searing process took max. 10 minutes and I did it in three batches of 3 slices each. This is a very rich dish. You have to taste it in one full layered bite, don't be tempted to remove the fat layer. It is sandwiched between the sear and it is pure heaven. I served this with some sauteed swiss chard (from Tomatero Farm) with shallots and garlic. Also, a really nice, light salad of butter and red leaf lettuces (from Full Belly Farm), segmented pommelo (from Chinchiolo) and CALIFORNIA avocados (yes, they are available at the farmer's markets now and even if they are not organic, buy them, they are infinitely better than anything that comes from other continents!) 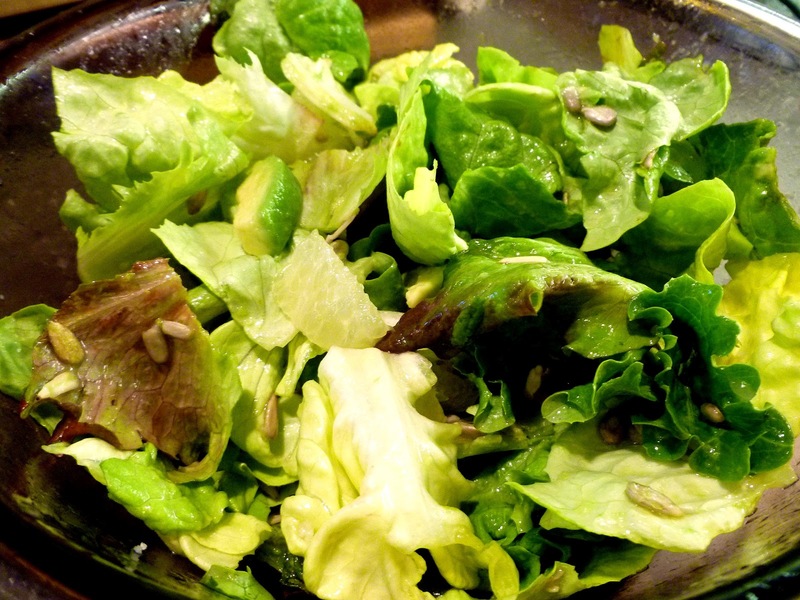 I dressed the salad in a little pomegranate champagne vinegar, olive oil, juice from the pommelo and salt and pepper. It was a perfect foil for the pork belly. I don't know whether to start tonight's post with the disaster that happened in my kitchen tonight, or the success. I had such high hopes for this meal, and it started out amazing with the salsa and everything was going fine with the first part of the prep and then the stuff got into the pan and it all went to hell. I think I'll start with the positive. 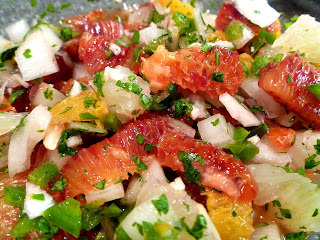 This Blood Orange Salsa was posted on another blog and I immediately wanted to make it. You should start seeing some organic blood oranges at the Farmer's Markets soon (Blue Heron Farms has historically great ones), I had to get these at Whole Foods. They are the "Moro" variety and not organic, but from California. The tangerines I used were from Olsen Organic Farms--he regularly sells out of citrus by 10am so get to the market early if you want any of his amazing oranges or tangerines. I also added pommelo from Chinchiolo farms. You can definitely add avocado to this as well. I left it out only because the main dish had plenty of fat going for it. Just toss everything together and let sit for about 20-30 minutes, or refrigerate and store for a couple of days. This was awesome just eating straight from the bowl. Like I said, add avocado and you are golden. This was supposed to be the Pecan Encrusted Tilapia served with the Blood Orange Salsa. 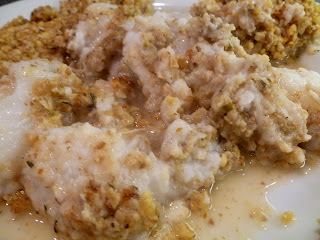 What it turned into was Walnut Crusted Turbot (Sole) Mush that was completely inedible. A somewhat expensive mistake, but it happens. I'm not going to go too into it, but I guess the cod is too oily of a fish, and with the oils from the walnuts and coconut listed in the recipe, it all just did not translate. We ended up tonight with grilled Chicken Apple Sausage (Aidell's organic) and the kids had hot dogs (Prather Ranch). We did put the salsa all over it and it was awesome. Almost all the recipes I read for preparing Osso Buco followed the same trajectory. I'm posting the one from Epicurious with a few adjustments. The entire family loved this and I convinced Steve to eat the marrow (rich in monosaturated fats) with me straight out of the bone. I loved it but you can't eat a ton of it. Steve thought it tasted like foie gras, so it's all good in my book. I served this with sauteed beet greens, thank you Hilah S. for the idea to use them a few years back. Quite a few stands selling beets right now at the farmer's market. I got mine from Full Belly Farm last week at the Thursday market, roasted the beets earlier in the week and kept the greens in my Debbie Meyer Green Bags until I was ready to use them today. They are wonderfully mild and the kids don't fight me when I tell them they have to finish their greens. For gremolata (make sure you don't skip this, it really makes the dish! Special equipment: a 7- to 9-quart heavy ovenproof pot (wide enough to hold shanks in 1 layer) OR you can do this in the crock pot no problem. Set on low for 6 hrs. Pat shanks dry and season with salt and pepper. Heat oil and 2 tablespoons butter (or coconut oil) in ovenproof pot over moderately high heat until foam subsides, then brown shanks well in 2 batches if you have to, 10 to 12 minutes per batch, transferring to a plate. Reduce heat to moderate and add remaining tablespoon butter (or olive oil if trying to omit dairy) to pot along with onions, carrot, celery, and garlic and cook, stirring, until onions are pale golden, about 5 minutes. Add remaining stew ingredients and bring to a boil, stirring. 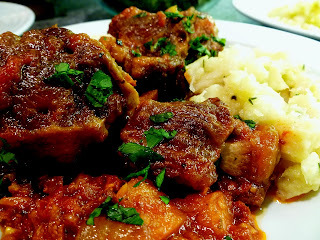 Arrange shanks in pot in 1 layer and return to a simmer. Cover pot and braise shanks in middle of oven until very tender, about 2 1/2 hours. 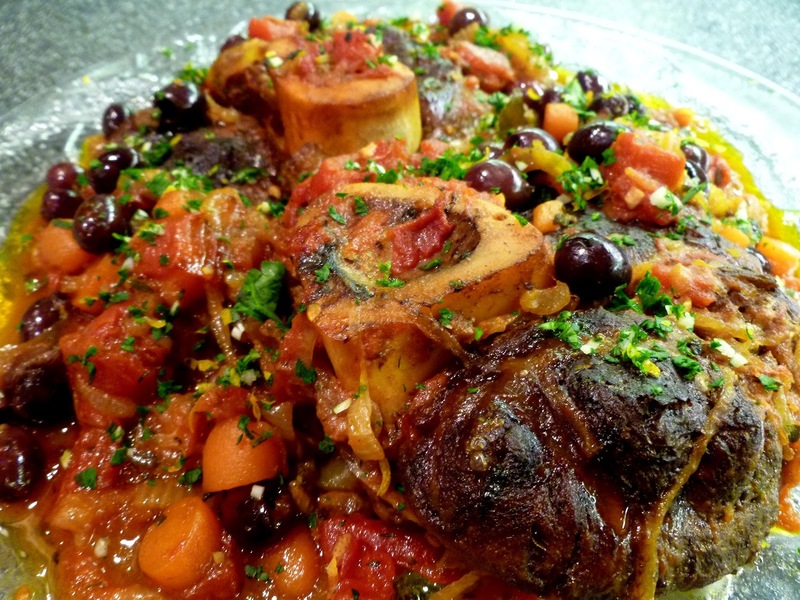 Remove strings from osso buco and discard along with parsley sprigs and bay leaf. Stir together gremolata ingredients in a small bowl and sprinkle over osso buco. Serve immediately. 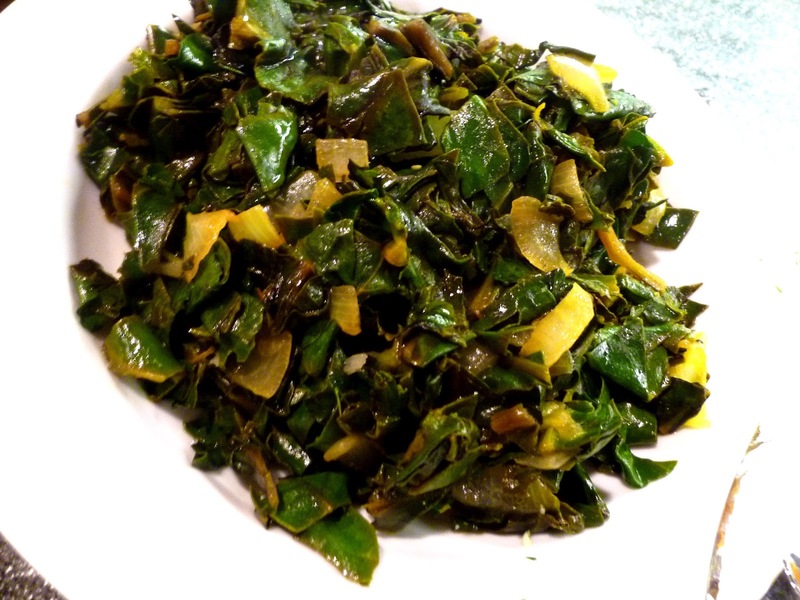 Wash beet greens thoroughly. Chop into smallish pieces. Saute in olive oil 1/2 onion, chopped, until soft. Add the beet greens and some chopped garlic. Continue to saute until greens have softened quite a bit. About a minute before ready to finish, squeeze half a lemon (some gorgeous Meyer lemons all over the place right now) over the greens, add salt and pepper and toss everything together. I originally had in mind to do an oxtail soup when I picked up a pack from Prather Ranch a week ago, then time got away from me and we went to dinner the other night at Pizza Antica and had their clams with chorizo and I got the taste for chorizo instead. A couple of clicks away on Epicurious and I ran into this recipe for Spanish-Style Oxtails Braised with Chorizo. I didn't change anything in the recipe other than using closer to 1/2 lb. of chorizo so just click on the link and go for it. It's difficult to find good quality chorizo that does not have sugar or dairy products but I found a fully cured one at The Spanish Table at Strawberry Shopping Center and it was perfect. I also picked up my paprika there, a "dulce" one, not smoked, and it really helped keep the heat down so the kids could really enjoy the dish. I served this with "Smashed Celeraic" from Jamie Oliver's Happy Days with the Naked Chef. Something very cool about celery root I learned from Sally Fallon, in Nourishing Traditions. It, like coconut, bone broths, and lacto-fermented beverages (like Kombucha), has Chloride in it. This is interesting in this particular meal as among other things, Chloride is "needed for the production of hydrochloric acid and hence PROTEIN DIGESTION" (the caps are mine). She goes on to say that the most important source of chloride is salt, but I thought it was cool that we had such a meaty meal and the tools to help our bodies digest it well! Peel the celery root and dice into uniform size cubes about 1/2 inch. Heat about 3 TBSP. olive oil until hot but not smoking. Add the celery root and brown about 5 minutes. Add garlic and thyme and saute another 5 min. Add stock, cover, and simmer for another 20 minutes until easily pierced with a fork. Smash it up in the pan leaving it a bit chunky. Season with salt and pepper. This is so incredibly simple, I don't know why I didn't think of it myself. This dish came from the latest edition of Wise Traditions (using a recipe from Nicola Graimes' Kids' Fun and Healthy Cookbook), a publication produced by the Weston A. Price Foundation. They have a rich, deep well of information about food, food production, and consumption and it is well worth your time to check out their website. The beauty of this dish is you can make it even more simple by using any deli meat of your choice. I found a turkey and pastrami deli meat from DaBecca Foods that has no sugar in it at Whole Foods. The bacon I used for today was "Rustic Bacon" from Prather Ranch. If using bacon, cook it in 425 oven for 10 min. or in skillet to just under done. No need to heat deli meat if using. Spray a muffin tin with sunflower oil spray, coconut oil spray, olive oil spray depending on your taste. I did mine with sunflower today. Line cups with bacon or deli meat. Doesn't have to be pretty. 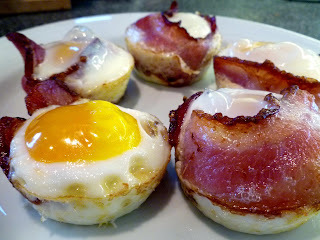 Crack one egg right into cup over the meat. Cook 10-15 min. Check at 10 minutes for the set of the egg. You want the whites to be opaque and firm. I like my egg with a bit of softness to it, so mine took about 15 min. and the yolk was mostly set. Let them cool slightly then run a knife around the edges and gently lift each egg cup out. These were great warm, even better cold with chipotle Tabasco on it. It would be equally outstanding with tomatillo salsa or a chimichurri. Kids wolfed them down too.